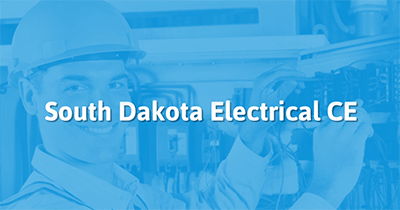 Our courses are approved by the state to satisfy your South Dakota electrician continuing education requirements. Take the continuing education to renew your SD electricians license today. All of our courses can be completed At Your Pace Online to help you meet the state's requirements to maintain your license. Once you finish your class you will have an official certificate of completion to save for your records. In the state of South Dakota, electricians are required to obtain 16 hours of continuing education every even-numbered year. 8 hours must cover Code changes. The other 8 hours may be Industry or Code related. In South Dakota, only 8 hours can be taken online. This course is designed to help you meet your continuing education requirements by covering changes made to Chapters 4 & 6 of the 2017 NEC. The course has been approved by the State of South Dakota and will be reviewing code for the following two subjects: Equipment for General Use, and Special Equipment. This course is designed to help you meet your continuing education requirements by covering changes made to Chapters 1-3 & 7 of the 2017 NEC. The course has been approved by the State of South Dakota and will be reviewing code for the following subjects: General & Definitions, Wiring & Protection, Wiring Methods & Materials, and Special Conditions. Our 8 hour course includes: NFPA 70E - High Voltage Safety, OSHA for tradesmen, and Photovoltaic Systems. Our online course is approved by South Dakota Electrical Commission. Our South Dakota electrical continuing education courses are done At Your Own Pace. This course is designed to help you meet your continuing education requirements by covering changes made to Chapter 5 of the 2017 NEC. The course has been approved by the State of South Dakota and will be reviewing code for the following subject: Special Occupancies. This course is designed to help you meet your continuing education requirements by covering changes made to Chapters 1 & 2 of the 2017 NEC. The course has been approved by the State of South Dakota and will be reviewing code for the following two subjects: General & Definitions, and Wiring & Protection. This course is designed to help you meet your continuing education requirements by covering changes made to Chapters 1, 8 & 9 of the 2017 NEC. The course has been approved by the State of South Dakota and will be reviewing code for the following two subjects: General & Definitions, and Communication Systems. This course is designed to help you meet your continuing education requirements by covering changes made to Chapter 2 of the 2017 NEC. The course has been approved by the State of South Dakota and will be reviewing code for the following subject: Wiring and Protection. After a participants has attended your class and wishes to apply for South Dakota continuing education credit, they need to send us a copy of their certificate attendance. Please specify on the certificate if the hours completed are code or non-code. Effective July 1, 2010 each continuing education provider shall provide each participate a certificate of attendance. Per 20:44:17:10, the certificate must contain the license holder’s name, SD license number, course title, date, location of course, number of credit hours, whether it is a preapproved course, signature of coordinator or instructor. Please also include the sponsor of the class. You may use this course number for the above class until August 15, 2020. You do not need to have future classes approved for this course. This approval is only valid in the State of South Dakota. If you wish for other State’s approval, you will need to apply with that State. Thank you for supporting our Continuing Education Program.